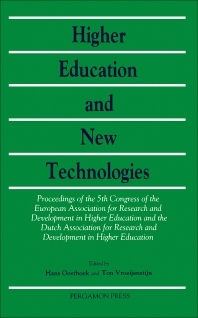 This volume contains the proceedings of the 5th Congress of the European Association for Research and Development in Higher Education (EARDHE) and the Dutch Association for Research and Development in Higher Education (CRWO). The focus of the Congress was the application of new technology both in the fields of teaching/learning and in management organization and administration. Though teaching and learning are the core fields of interest, this work reflects the growing importance of R & D in university management, planning and organization. Three main themes are discussed: the influence and consequences of new technologies for learning and instruction, the influence and consequences for management and institutional structures and the possibilities of new technologies in developing countries. For researchers and students in higher education and information technology. (Selection of papers.) Foreword. General Addresses. The development of computer based training: a review of the state of the art in higher education in the Netherlands, A. Pilot and H. Oosthoek. Innovative Prototypes: Expert systems and intelligent tutoring: some issues in the engineering of pedagogic knowledge, P. Goodyear. Intelligent Tutoring and Expert Systems. Using the intelligent computer-aided learning systems "G" in linguistics, C. Dubuisson and M.W.F. Meurens. Law Teaching. Obligatio: computer-simulated legal cases, F.J. Fernhout. Social Science. Tandem: computer assisted practicing in demographic analysis, Ton Janssen. (Foreign) Language Teaching. Medical Science. Science and Technology. Monte Carlo simulation of the Ising model: a CAL package on statistical mechanics, J.M. Thijssen. Mathematics. Biology. Veterinary Science. Design and Development Approaches. A knowledge-base for instructional design, Franklin C. Roberts. Courseware Development Models and Authoring Tools. Instructional Design Research. Computers in support of conceptual learning, Zvonko Fazarinc. Management Information Systems in Education. The design and impact of management information systems in educational organisations, Leo Essink and Adrie Visscher. Interactive Video. Image learning: higher education and interactive videodisc, Ben Davis. New Technologies and Third World Countries. Computer assisted learning in higher education in developing countries, C.T.A. Ruijter and J.H.P. van Weeren. Implementation, Management and Social Impact. Games and Simulations. Teaching Educational Technology: Conceptions and the Curriculum. List of authors and addresses.